Emperor Xuande ascended the throne of China in 1426: his reign is celebrated amongst Chinese connoisseurs for the superior quality of its porcelains, bronzes and lacquers. Xuande himself reportedly took a personal interest in the 58 kilns at Jingdezhen which were occupied with filling the Imperial orders for porcelain, and the blue and white porcelain of this period is considered the finest ever made. The style and decoration of Xuande blue and white was much copied in succeeding reigns. This stem cup would have been an Imperial ware made for the use of the court. While stem cups were used at the court as either wine vessels or ceremonial cups in Buddhist rituals, during the Xuande period they were almost solely used for Buddhist rituals intended to be placed on an altar before the image of a Buddha or Bodhisattva and filled with clear water. The decoration confirms this vessel to have been used in Buddhist rituals - the decoration is the Eight Buddhist emblems resting on lotus blossoms, a Buddhist symbol of purity. 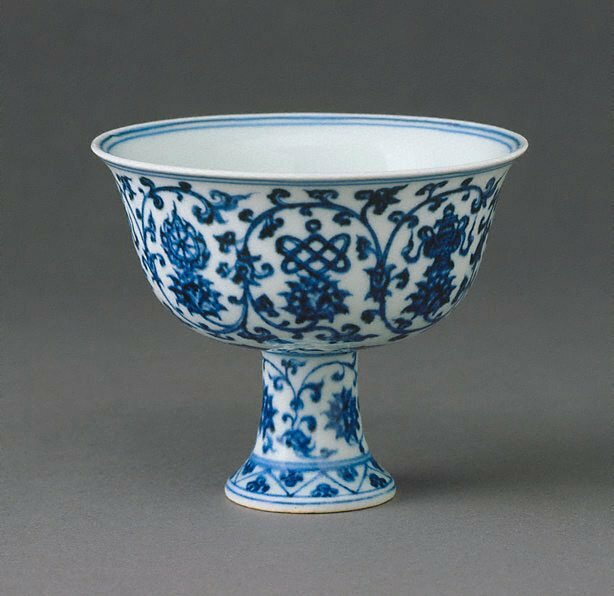 The decoration illustrates the 'heaped and piled' effect, the unevenness of colour which results from the heavier application of the underglaze blue in some parts, an effect esteemed by connoisseurs of Chinese ceramics, partly as proof of authenticity. Asian Art Department, AGNSW, 14 November 1979.